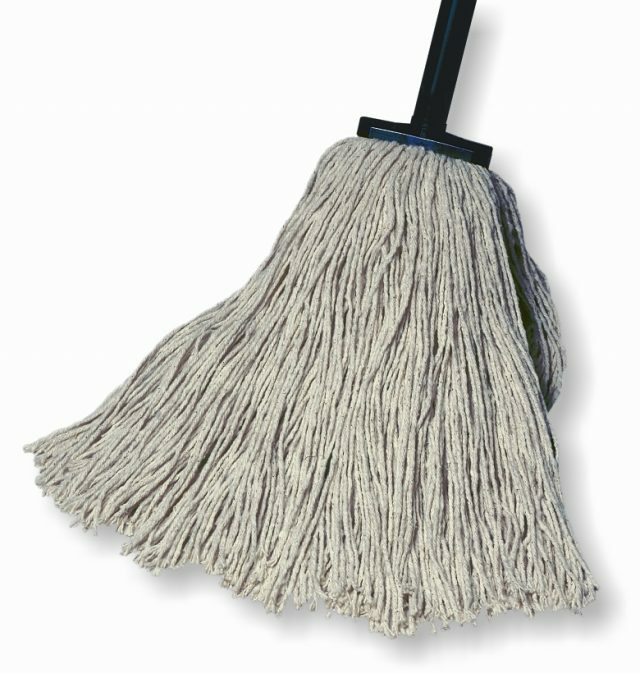 Our Premium Dust mop offers a more durable mop that is easier to clean than cotton dust mops. Made from a colorfast synthetic yarn that has a built in static attraction. Requires no treatment chemicals. Simple rinsing and drip drying will keep mop clean in most cases. Available in three styles: Keyhole Square End, Keyhole Round End, Slot Pocket. Available in choice of yarn and backing: blue, yellow, green, white and orange. Sizes available: 5” width ranging from 12” to 72” in length. Our Professional Dust mops are constructed for intensive laundering and use. These high performance dust mops are pre-laundered and ready to use. Available in three styles: Keyhole Square End, Keyhole Round End, Slot Pocket. Constructed for intensive laundering and rigorous use. Factory pre-laundered and ready-to-use. 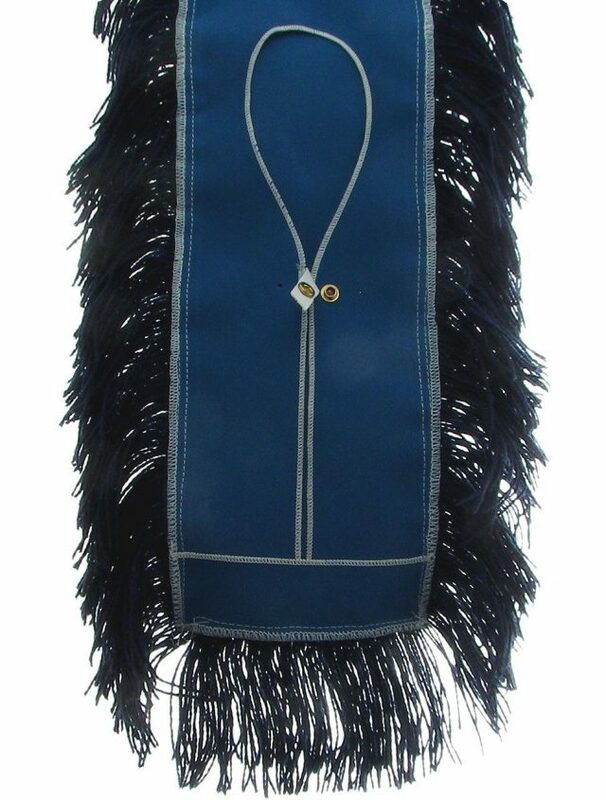 Tough polyester twill backing won't shrink and is dye-fast Tufted superset yarn (75% cotton / 25% poly) virtually eliminates yarn frazzle and untwisting. SS yarn is dyed. The yarn and twill backing colors are blue, green, orange, red, yellow. Our Professional Dust mops are constructed for intensive laundering and use. These high performance dust mops are pre-laundered and ready to use. Available in three styles: Keyhole Square End, Keyhole Round End, Slot Pocket. Constructed for intensive laundering and rigorous use. Factory pre-laundered and ready-to-use. Tough polyester twill backing won't shrink and is dye-fast Tufted superset yarn (75% cotton / 25% poly) virtually eliminates yarn frazzle and untwisting. HS yarn is not dyed and is only available in natural color. There is a choice of colored twill backing: blue, green, orange, yellow, red, white. SS yarn is dyed. The yarn and twill backing colors are blue, green, orange, red, yellow. 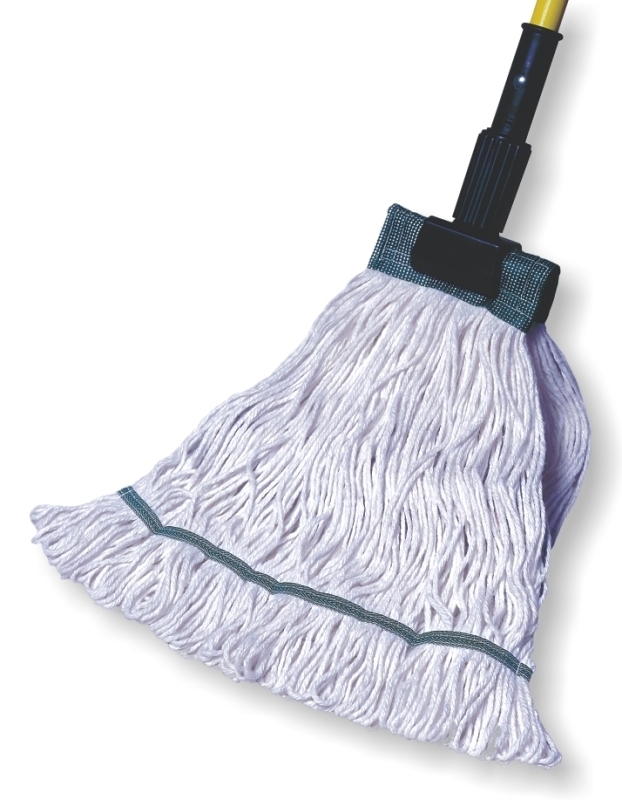 This cut end wet mop comes with a heavy duty plastic attachment that screws onto the handle. 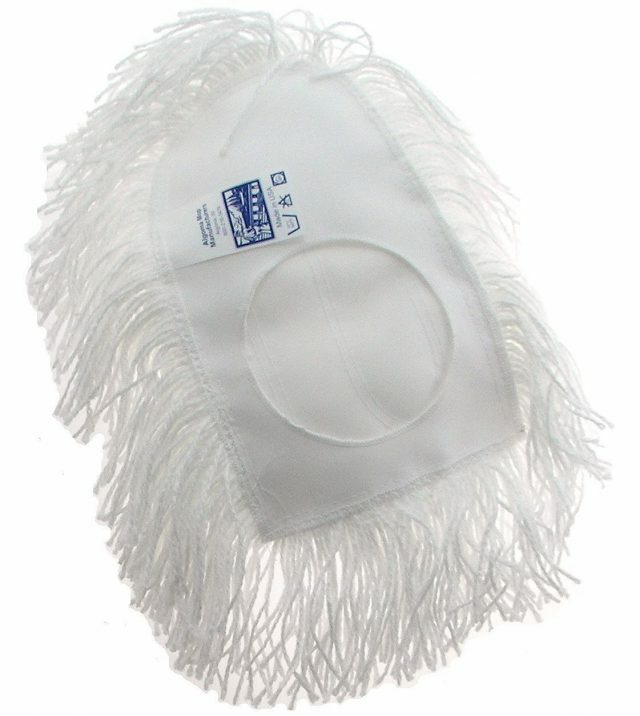 It is made with rayon blended yarns which are superior in absorbency and do not require a break-in period. The Rayon material has minimal linting and is ideal for applying floor finish and disinfectants. It is also more bleach resistant and mildew resistant than cotton yarns, and is more durable because it is produced with 100% long staple synthetic fibers. 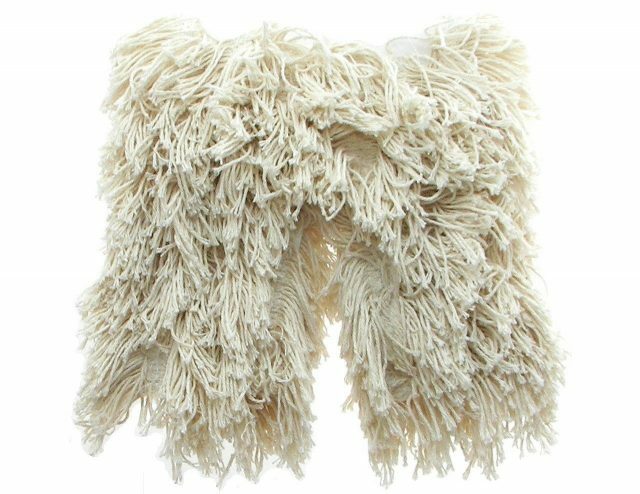 • Made with rayon blended yarns • This mop yarn is produced from fiber that is reprocessed from plastic reclamation making it an excellent choice if you have a green cleaning program. • Sizes Available: 16, 20, or 24 ounces. Use with your choice of handles LF54, LF60 or MLF60 shown in our hardware section. 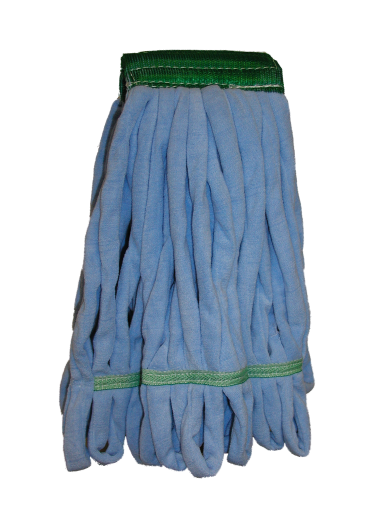 Our Rayon wet mop is perfect for liquid application. Rayon keeps chemicals and disinfectants on the floor longer, which is significant in health care facilities. Made from 4-ply rayon/synthetic blend yarn. Fast drying, relatively low lint. Mildew resistant. Looped ends resist tangles and frays. Durable vinyl-coated polyester mesh center band available in wide or narrow. White only. Sizes available: 12, 16, 20, 24, 28 ounces. The Relintless™ Microfiber Looped End Wet Mop glides smoothly over rough, abrasive floors and won't shred or lint. 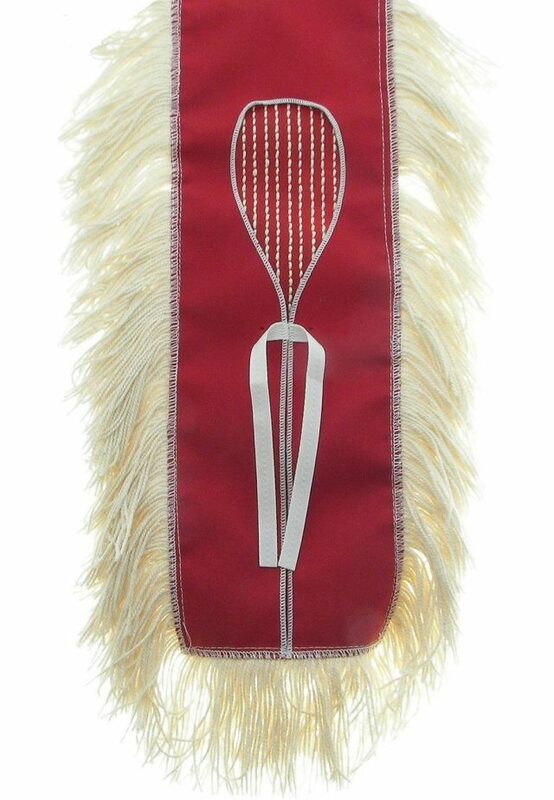 Unique microfiber blend picks up the smallest dirt particles for deep cleaning. Heavy-duty strands stand up to everyday mopping. Fantail style provides wide surface span and even coverage. Can be laundered and reused. Do not bleach and/or fabric softener. Comes with a 5" (12.7cm) headband. Sizes Available: Medium (Green Band Color) - 16 oz. Large (Red Band Color) - 24 oz. 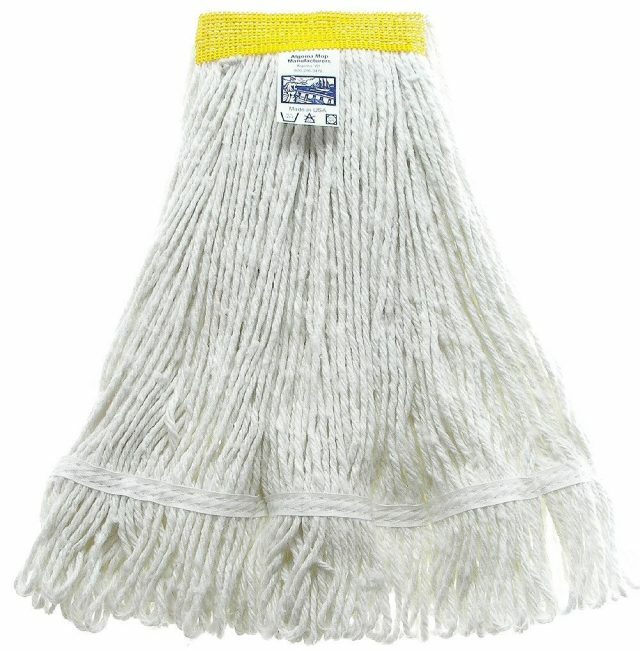 Our shrinkless mops are made with premium synthetic 4 ply yarns. Their durability will be long lasting and they are an excellent choice for general cleaning applications. Performance equivalent: Small = 8-12 oz. Medium = 16-20 oz. Large = 24-28 oz. X-Large = 32+ oz. 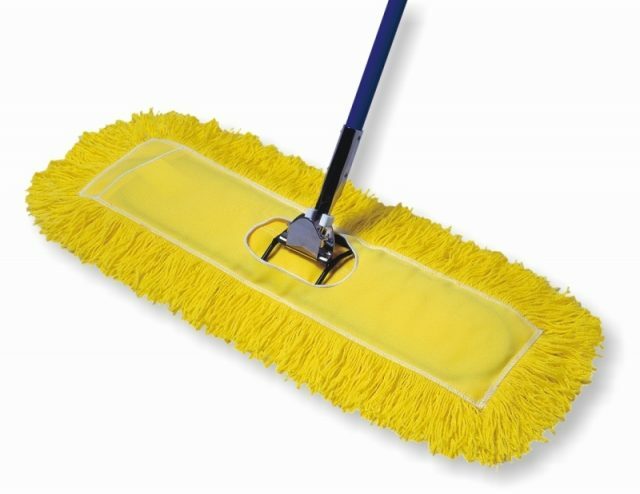 Our Split Duster is ideal for cleaning pipes, air vents and other hard to clean surfaces. Split duster is made from 4-Ply cotton blend yarn. Can be laundered and reused. Use with frame and handle #4050.